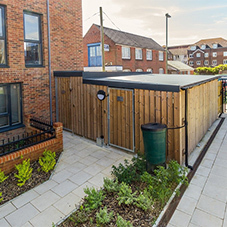 The Simply Group offer a wide range of innovative design Bin Stores, Cycles Shelters, Cycle Hubs and Smoking Shelters. A complete bin store design and installation package is available to suit individual requirements. Bin stores can be modified in a variety of ways to meet your tailored requirements, these include a wide range of dimensions and multiple options on doors and drain pipe locations.